If you’ve ever been the victim of a bicycle-car accident – and you have been lucky enough to have survived – you know already how awful an experience this can be. The sudden slamming of car brakes. The screech of a car tire that makes your heart stop. The sight of the cyclist, desperately trying to get his bike out of harm’s way. The sound of tons of steel and glass hitting just a few pounds of bicycle. In fact, bicycle-car accidents have happened so much that “ghost bike” memorials have sprung up all over the country, to memorialize those people who have been killed in bicycle-car accidents. These makeshift memorials usually consist of an older bicycle that has been completely covered in white paint – to resemble a ghost – and is chained to a tree or lamppost on a road where the accident took place. The symbolism there is to suggest that the deceased bike’s owner may still show up to claim their bike. But everyone knows all too well that the bicyclist has been killed – and will never be seen again. Car-bicycle accidents are more common than you may realize. The National Highway Traffic Safety Administration (NHTSA) estimates that in 2009, 51,000 pedal-cyclists were injured in motor vehicle traffic crashes. Of these, 17% (or about 8,000) of the pedal-cyclists who were injured were 14 years old and younger. 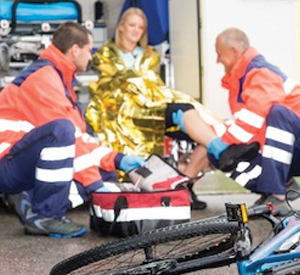 If you or someone you care about has been injured in a Massachusetts car-bike accident, after emergency medical treatment has been received, your first step should be to click here to receive our FREE article, “The Top 10 Things To Do After Suffering An Injury or Accident in Massachusetts.” This valuable article will give you a “road map” of what to do – and what not to do - following a Massachusetts car-bicycle accident. If you have been injured in this type of accident, you may be entitled to significant financial damages for your pain and suffering. After reading this article, call our offices at Ph. : (781) 320-0062, or at Ph. : (617) 285-3600; or click here to send us a confidential email. We’ll provide you with a FREE INITIAL CONSULTATION, and let you know what your best legal options are. While cyclists can certainly make mistakes, all kinds of driver negligence can result in an accident between a bicycle and a motor vehicle – as these examples illustrate. If you’ve been injured in a Massachusetts car-bike accident, make the best choice you can and call our office now at Ph. : (781) 320-0062 or at (617) 285-3600. Or you can click here to send us a confidential email. We promise to get right back to you. We’ll provide you with a FREE INITIAL CONSULTATION, and let you know what your best legal options are. If you recognize Attorney Kickham’s name, it’s probably because you’ve seen him on television or in newspapers. Attorney William Kickham is frequently sought out for his legal expertise and analysis by a variety of newspapers, TV and radio stations. These media outlets include, among others Court TV (now In Session on HLN,) Fox News TV-25/Boston, The Boston Herald, WBZ-AM Radio 1030, WCVB-TV5/Boston, Nightside With Dan Rea, Greater Boston With Emily Rooney, Money Matters Radio/Boston, and The Metro Newspaper/Boston. The media calls upon Attorney William Kickham because they know he is an expert in the field of Massachusetts injury law. Our promise to our clients: If we accept your case, we will not stop until we secure the maximum amount of financial compensation for you.